Next, let’s define a function that allows us to check the prototype. We take advantage of the fact that we can curry isPrototype to define isArray a simply a curried version of isPrototype. So far, so good. But we can still clean this up a bit. Now we can easily define type-checking helpers. We take advantage of currying again, only now we can just pass in the type, instead of the prototype. However, if we want to answer the question whether a given value is a bank account, we can no longer simply rely on the value’s prototype. Because its prototype might be our prototype checking account. Which is not the same as our prototype bank account. What we need to do is check the entire chain of prototypes to see if we eventually reach the bank account prototype. Even though we never defined a number property on myAccount or on the CheckingAccount prototype from which we created it, it’s still there. Of course, that’s because we defined it on the prototype for BankAccount, which we used to define the prototype for CheckingAccount. Of course, we want our helper functions to be able to take this prototype chain into account. What about instanceof? The problem with instanceof is that, for historical reasons, it doesn’t work as reliably as we’d like. So we need to define a function to allow us to check the prototype chain directly. This is analogous to our function that checks the prototype. We check to see if the given prototype is in fact that prototype for the given value. If not, we call isTransitivePrototype recursively with the value’s prototype, effectively following the prototype chain. We can now define type-checking helpers based on the prototype chain. By currying isType and isKind we can easily define type-checking functions. But what about defining new types? Can we make that a little easier? Let’s define two helper functions for defining new types and creating instances of those types. Now we can define our bank account and checking account types more succinctly. You’ve probably noticed by now that we’re not using constructor functions or the new operator anywhere. One reason we’re avoiding this is that we can (accidentally) call constructor functions like ordinary functions. (That is, without using the new operator.) This can lead to unexpected bugs which are difficult to find. We can prevent these by checking the value of this in the constructor function, but that’s still error-prone and awkward. And there are other reasons to avoid using new anyway. Instead, we construct objects using our Type.create function . But what if we want to initialize the value? For example, what if we want to assign a unique account number to each account upon creation. 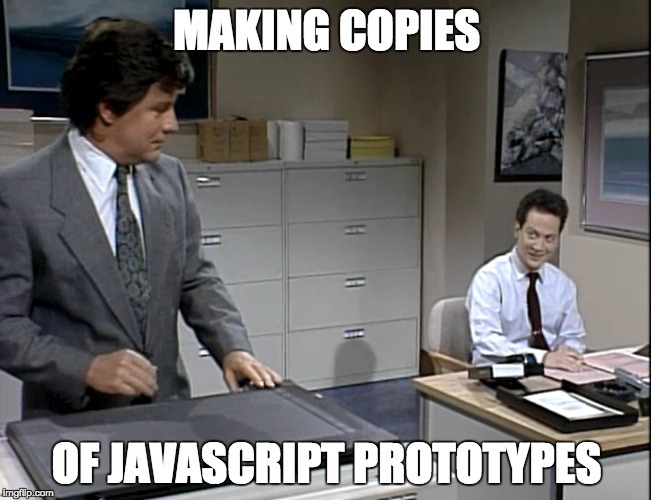 Simple: just add a create method to your type object. This works fine for a single type. But what if we want to ensure unique account numbers across all BankAccount values? If we were using classes, we’d reference the super class constructor, which would take care of setting the account number. But with prototype chains, there’s no “super” class. So how can we allow CheckingAccount to take advantage of common initialization details implemented by all bank accounts? The most general solution is to explicitly call the desired initialization function. That is, just call something along the lines of BankAccount.initialization. While this isn’t as succinct or expressive as super, there’s nothing wrong with being explicit. Arguably, this is actually easier to reason about than super.